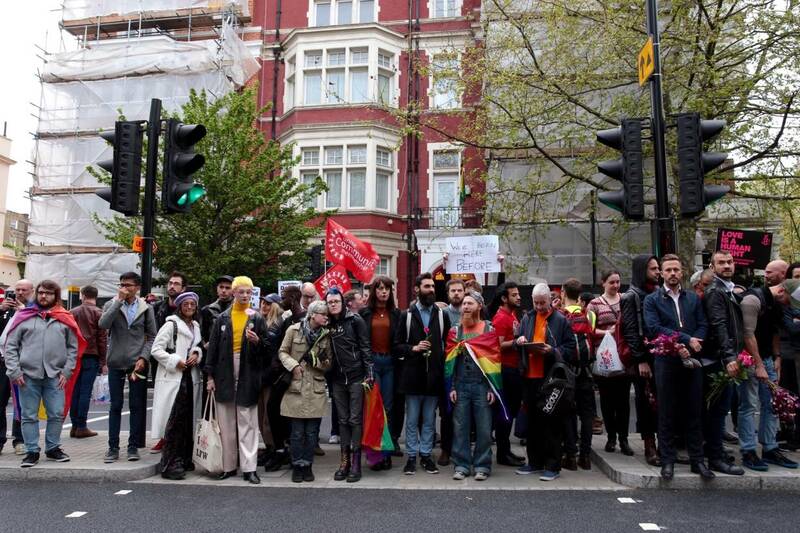 Hundreds of people gathered outside the Russian embassy in London [last] Wednesday to protest, after reports from human rights groups that up to 100 gay men are being held and tortured in “camps” in Russia’s southern region of Chechnya. Russian independent newspaper, Novaya Gazeta, reported at least three of the men detained had been killed in secret prisons that were branded “concentration camps”. The Chechen authorities could not be reached for comment but a spokesman for the region’s president, Ramzan Kadyrov, denied the allegations to other media, adding that gay men did not exist in Chechnya. Protesters in London chanted “close the camps” and “queer rights are human rights” before laying pink flowers outside the embassy. “When there are people elsewhere who are not afforded the same rights as we are, it’s important that we stand up for them,” Steve Taylor, the protest’s organiser and a campaigner for LGBT rights, told the Thomson Reuters Foundation. Svetlana Zakharova, a spokeswoman for the Russian LGBT network, told the Thomson Reuters Foundation by phone that “such campaigning against homosexual men is unprecedented in Russia”. The Russian LGBT network set up a hotline for victims of the abuses committed in Chechnya last month and has so far received around 40 testimonies. Zakharova said the organisation was arranging the evacuation of potential targets from the region to “save as many people as possible”. The crackdown comes a month after several cities in the North Caucasus, where the Chechen republic is located, asked for permits to stage a string of gay pride parades, Novaya Gazeta reported. “It is increasingly difficult for LGBT people to be safe in Russia,” Anna Kirey, Amnesty International’s deputy director of campaigns in Russia, told the Thomson Reuters Foundation. The situation in Chechnya is made worse by a conservative majority-Muslim society where any expression of sexuality that is seen as outside traditional gender roles is considered sinful, Kirey said. The targeting of LGBT people by their own families, and honour killings, are common in the region, she added. A spokesman for Chechen leader Kadyrov, who is a vocal supporter of Russian President Vladimir Putin, denied that any such activities have taken place. “Nobody can detain or harass anyone who is simply not present in the republic,” Alvi Karimov was quoted as telling the Interfax news agency. “If such people existed in Chechnya, law enforcement would not have to worry about them since their own relatives would have sent them to where they could never return,” he added.